We are going to be knitting on Sunday at Papa San at 1. Hope you all can stop by for a rice bowl and some logical chat about swine flu, the economy, people who don’t knit, and the events of this past week. 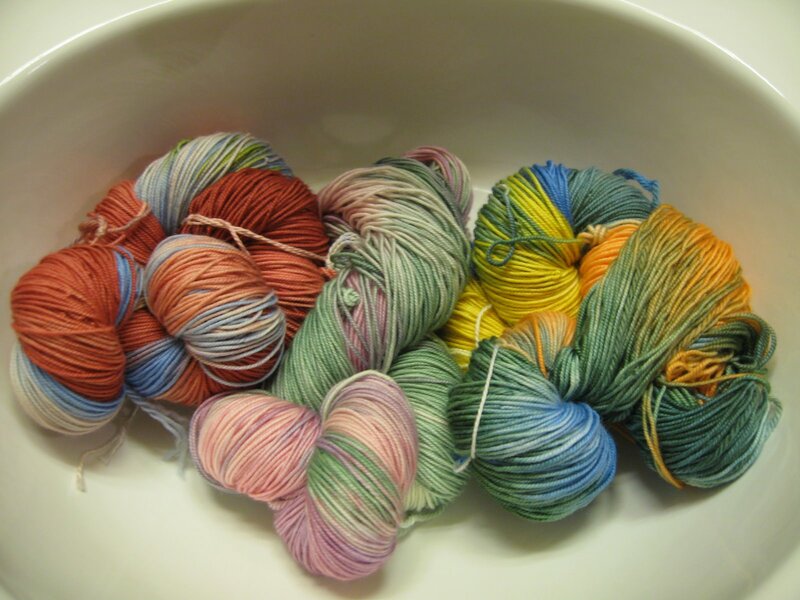 Here is my hand dyed yarn from Sock Camp. I am going to cast on a Taming of the Ewe scarf with the one on the right. Like I need another thing that is newly cast-on. I have 2 pair of socks in progress, a scarf, a shawl, and a baby blanket. I want to see something that works the way it is supposed to, that stacks up to be something aesthetically pleasing and more functional that it was before you started it. If you have ever knitted one of these, or if one of your friends has knitted one, you know that it doesn’t always go the way you planned, and there are small little adjustments you can make to get it to work the way you want it to. You have to constantly read your knitting, making those accomodations as needed and before you know it, you aren’t even thinking about it, you do them and things work out. And you want to do the same thing over and over and over again because each colorway has its own particular charm and is different from all the rest, because it is one of a kind. Things don’t always go the way we planned, but if we at least have directions showing us how to get there, needles, and yarn, we have a better than average chance of success. If you have everything except the yarn, can you complete this project? The answer is no. They are all dependent on each other. You can’t finish the job or even begin without one of them. How could you even consider starting? Where would you start? You can make something, but it certainly won’t come close to resembling what it is supposed to be. It may not even be able to do its job, which is to keep you warm The parts all have to work in harmony with each other. If this is the first time you have read this blog, you probably looked it up to see my rant in the last two postings. Or maybe you read them and you are tuning in to see what else I have to say. I took them down today because they have done exactly what I wanted them to do, which is to open the conversations that need to be taking place. If the dialog that was supposed to take place between district admin and the employee groups who would be affected took place as promised, we would not be in the mess we are in. In the case of the 3 LPNs, they share at least 36 years of experience and loyalty to their employer between them all. They weren’t even given options. There are positions they could fill on their own campuses. But no one even thought to ask them if they would be interested. If you had ben working there this long,, do you think that you would deserve at least an option to stay in a different position that was lower pay? ok, this one might get you into trouble. i like the allusions though, they had me laughing and i reeeeaaaallly needed to do so today will tell you about it later since people who should be poked with our sticks and causing us not to use them to make the world a better, calmer place might be reading.